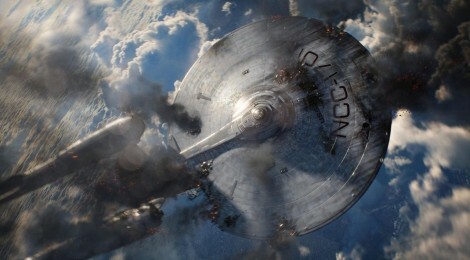 Movie Review - Star Trek Into Darkness - Honk if you love justice! There will be spoilers. You are warned. If there’s anything I know from reading reactions to Star Trek Into Darkness, it’s that it is very polarizing. You are going to love it or hate it. The middle ground ‘it was decent’ option is pretty darn uncommon. To best prepare you for discussing STID, I’m going to give you some key phrases you’ll hear in the arguments about the movie. Plot Holes – They are Jupiter-sized and multiple. There’s a lot that happens where the filmmakers pretty much just hope you won’t be thinking about it hard (or at all). Why do they need ‘Harrison’ alive if there are 72 other supermen in tubes they can get blood from? Are they like Marvel’s mutants, where they have different superpowers? Why thaw out a 20th century guy to make weapons? I could see studying them, maybe recreating the Eugenics tech that created them – might’ve made an even better movie. Bad Science – Cold fusion doesn’t do what you think. The ability to transwarp transport stuff could solve a lot of your problems, and create a bunch of really terrible ones. “Hey, I can transport myself to the Klingon homeworld from here in the Federation! Wait…on second thought, I’ll just beam a bomb into that Starfleet briefing and take a nap.” Magic blood that heals…I assume no one gets sick or dies again now ever, right? Look, I know that the previous Trek stuff is full of pseudoscience, but there was consistency to it – things you can do, things you can’t. When you are willing to hand-wave everything away with a cheap fix that doesn’t fit the universe that’s been 40 years in the making, you just lost ALL your tension. They defeat DEATH, what threat will they face on their five year mission greater than that? Fan-service – Tribbles! Harry Mudd! Carol Marcus! Section 31! Prime Directive! I can confirm that JJ/Orci/Kurtzman definitely read Memory Alpha at some point. And while I can appreciate the reversal in the ending, but the only reason Spock should scream like that is when he’s mind-melding with a Horta. Lame. And at least Spock stayed dead through the rest of ST II. Women in Trek – Read Felicia Day’s thoughts on this. She’s got the serious concerns down. You know what’s bothering me? Sticking with the 60’s aesthetic with the uniforms for the female characters. The Original Series didn’t know any better, but yeah, we don’t require women to wear ridiculous uniforms in the military NOW, why would they in 2-300 years? Even Troi got to wear pants eventually. I know that there’s only one traditionally female lead in Uhura, but why can’t she save the day at least once? She should’ve successfully talked the Klingons out of killing them. Stunning Khan had worked before, did it not in the endgame just because a girl was holding the phaser? Khan is…white? – When Young Spock called Old Spock about Khan, I kept waiting for Young Spock to show him a picture of the current Khan…and Old Spock to tell him, no, you must have the wrong guy. Don’t get me wrong, I enjoyed seeing the movie quite a bit. Seeing being the operative word…the visuals were amazing. In fact, it wouldn’t surprise me one bit if the filmmakers had come up with some really awesome scenes they wanted to film/create and all of the plot inconsistencies came about when they shoe-horned them in. That’s how you end up with a ship rising out of the ocean to fly over a volcano. It’s actually a fitting metaphor for the movie – a visually stunning sequence that everyone in the audience figures out a better way to solve within minutes.